Draft: 2009, Kansas City Royals, 3rd rd. William Bradford Myers…married his wife, Maggie, in November 2018...committed to the University of South Carolina before signing with the Royals…graduated from Wesleyan Christian Academy in High Point, N.C. in 2009…finished his senior year batting .532 with 14 home runs and 41 RBI and was named the second-best "Pure Hitter" in the 2009 draft by Baseball America…led his squad to the North Carolina state title as a junior in 2008, pitching to a 10-0 record, including the victory in Game 1 of the best-of-three championship series…originally signed by Royals' scout Steve Connelly. Appeared in 83 games and made starts at 3B (36), LF (30), RF (nine) and 1B (two)…missed 70 games across three separate 10-day DL stints...Landed on the 10-day DL on 4/4 (retro 4/3) with right arm nerve irritation and missed 15 games…reinstated from the DL on 4/20 and hit safely in four of his seven games (9-for-28, .321), including a career-high-tying four hits on 4/23 at COL, before being placed on the 10-day DL on 4/29 with a strained left oblique...Reinstated from the DL on 6/21 after missing 47 games…through his next 33 games through June and July, hit .271 with 10 doubles, one triple, eight HR, 27 RBI and 16 runs...Recorded the ninth three-HR game in franchise history on 7/7 at ARI, becoming the eighth Padre to accomplish the feat (Steve Finley did so twice in 1997)...the Padres joined the Red Sox as the only teams in 2018 with two different players who recorded threehomer games (also: INF Christian Villanueva on 4/3 vs. COL)... the Red Sox had three such games (two by Mookie Betts, one by Steve Pearce)...became the first player since 1900 to homer three times in a game which his team lost by double figures...Went on to homer in a career-high four consecutive games from 7/7-10, one of just two Padres to homer in four straight in 2018 (also: Hunter Renfroe, 8/5-9)…his six home runs in the four-game stretch were one shy of a franchise record (Nate Colbert, seven in 1972)...the last Padre to homer six times in four games was Ken Caminiti in 1995...Tied for the NL lead with 23 RBI in July (also: CHC Javier Baez and MIL Christian Yelich)...Placed on the 10-day DL on 8/4 (retro 8/3) with a left foot contusion/bone bruise and missed eight games before being reinstated on 8/13...Over his final 39 games from 8/13-9/30, slashed .229/.319/.357 with 12 doubles, two HR, nine RBI and 18 runs scored...Converted 13 of his 14 stolen base attempts…his 92.9 stolen base percentage ranked fourth among all ML players with double digit steals...Slashed .297/.357/.516 with 17 doubles, five HR, 23 RBI and 24 runs scored in 42 road games compared to a .210/.279/.376 line with eight doubles, six HR, 16 RBI and 15 runs scored in 41 home games. ...Hit .316 (18-for-57) with RISP, .269 (7-for-26) with RISP/2 out and .375 (3-for-8) with the bases loaded...Slashed .323/.406/.591 from the seventh inning on compared to a .224/.278/.384 line from innings 1-6...Posted a .296 average (29-for-98) in one-run games...Hit .303 (36-for-119) in SD wins, while hitting .223 (43-for-193) in losses...His highest batting average came against NL West opponents (.272, 49-for-180), including nine of his 11 home runs...Took advantage of first pitches and being ahead in the count, hitting .485 (16-for-33) in 0-0 counts, .316 (6-for-19) in 1-0 counts, .500 (9-for-18) in 2-1 counts, .667 (2-for-3) in 3-0 counts and .400 (2-for-5) in 3-1 counts. Led SD in nearly every offensive category, ranking first in games played (155), at-bats (567), runs scored (80), hits (138), doubles (29), home runs (30), RBI (74), walks (70) and stolen bases (20)... Became just the second Padre to record multiple seasons with at least 25 home runs and 20 stolen bases, joining Ryan Klesko who accomplished the feat in 2000 and 2001... His 20 stolen bases in 2017 led all MLB first basemen and his 48 stolen bases since the start of the 2016 season rank second, behind only Paul Goldschmidt's 50 swipes... Among all MLB first basemen since the start of 2016, he ranks tied for third in triples (seven), fourth in at-bats (1,166), tied for fifth in games played (312) and runs scored (179), tied for seventh in RBI (168) and extra base hits (120), eighth in doubles (58), total bases (539) and walks (138), tied for eighth in home runs (58) and 10th in hits (293) and multi-hit games (80)... On 4/11 at COL, he hit a single, a double, a home run and a triple in that order to account for the second cycle in team history in the club's 7,660th all-time game…it was his first career cycle as he had fallen a triple shy of the cycle on seven separate occasions in his career (ELIAS)... The cycle was the 313th in Major League history, the first of the 2017 MLB season and the eighth by an opponent in Coors Field history...it was the 15th total cycle at Coors Field since the park opened in 1995 and the most recent since former Padre Matt Kemp on 8/14/15 in the club's 7,444th all-time game... There were only three cycles in between Myers' and Kemp's in all of MLB… in between Kemp's and Myers' cycles, there were 215 games played by the Friars and a Padre had fallen one hit shy of a cycle on 23 occasions, including 22 times missing the triple…in all, prior to Myers' cycle, a Padre had fallen one hit shy of a cycle 384 times, including 280 times missing the triple (ELIAS)... Myers' fourth hit was a triple, finishing 4-for-4 at the dish with two RBI and two runs scored…the four hits also tied a career high (4x, most recently: 7/5/16 at ARI)... Enjoyed his best month of the season in April and hit .310 (35-for-113), starting all 27 games for the club and hitting safely in 22 of them…his 35 hits were the most in any month in his career and his 20 RBI tied for the second-most in any month (33 in June 2016)... Hit safely in a team-high-tying 11 straight games from 4/9-20 (also: Jose Pirela, 7/9-24), hitting .429 (18-for-42) over the streak...one-game shy of his career-high 12-game hitting streak (2x, 7/13-7/31/13 while with TB and 4/15- 27/16 with SD)... Hit safely in 12 consecutive road games from 4/4-25, matching his career high in his rookie season with TB (7/4-8/9/13)... On 4/29 at SF, he highlighted the Padres' eight-run top of the sixth inning, the most runs SD had scored in a single inning since 5/1/15 vs. COL…he led off the frame with a single and capped it off with a three-run home run, marking the second time in his career that he collected two hits in a single inning (also, 4/9/16 at COL in the top of the ninth, a home run then a single)... The following night, hit a go-ahead three-run home run in the top of the 12th inning on 4/30 at SF for his first career homer in extra innings to lead the club to the 5-2 victory... Homered in a career-high three consecutive games from 7/21-23 at SF…it was his fifth of six occasions homering in consecutive games during the '17 campaign... Swiped three bags in the fourth inning on 8/16 vs. PHI…it was the first time in his career he had three steals in a game and he became the first Padre to ever steal three bases in a single inning (ELIAS)…he was just the third first baseman since 2000 to steal three bases in a game (SD's Ryan Klesko on 5/24/01 and ARI's Paul Goldschmidt on 10/1/16)... Recorded his fifth-career multi-home run game on 9/9 at ARI in the Padres' 8-7 victory…his .320 career average at the end of 2017 against the Diamondbacks is his highest against any club with 60-or-more plate appearances and his 37 total hits at Chase Field are his most at any visiting ballpark... Hit his career-high 30th home run of the season on 9/30 vs. SF, the first Padre to hit 30-or-more home runs since Chase Headley hit 31 in 2012…he hit six home runs in nine games played at AT&T Park, which is tied with COL's Nolan Arenado's six in nine games in 2015 for the most homers by a visitor in a single season…only Brandon Belt had more homers (eight in 50 games) than Myers at AT&T in 2017. Had a career season, setting career highs in nearly every offensive category in 2016 and named to his first career National League All-Star team...Became the first Padre in team history to post a season with 25-or-more doubles, home runs and stolen bases and was one of just three in the Majors in 2016 to post those numbers, joining Mookie Betts (42 doubles, 31 homers, 26 stolen bases) and Mike Trout (32 doubles, 29 home runs and 30 stolen bases)...Per STATS, Myers is one of only three Major League first baseman (based on primary position in season) all-time to have a season with 25 doubles, home runs and stolen bases, joining Joe Carter (27 doubles, 32 home runs, 31 SB in 1987) and Jeff Bagwell who did so twice in 1997 (40 doubles, 43 home runs, 31 SB) and 1999 (35 doubles, 42 homers, 30 SB)...Earned National League All-Star honors, hitting .286 (97-for-339) with 19 doubles, two triples, 19 home runs, 60 RBI and 61 runs scored with 15 stolen bases and an .873 OPS over 87 games in the first half of the season...Myers started the game for the National League team, batting cleanup as the designated hitter and going 1-for-3 with a double in the NL's 4-2 loss to the American League...On 6/7 vs. Atlanta he hit a game-ending single to give the Padres a 4-3 win over the Braves, his second career walk-off hit and first since 8/3/13 for TB...At home he hit .306 (93-for-304) with 20 doubles, two triples, 18 homers, 58 RBI and 60 runs in 80 games, compared to .210 (62-for-295) with 10 home runs and a .633 OPS in 77 games on the road...He set Petco Park single-season records in several categories, including hits (93), home runs (18), RBI (58) and runs (60), along with a .306 average that ranked tops among all players with at least 250 at-bats in a single season in Downtown San Diego...Enjoyed his best month of the season in June when he was named National League Player of the Month after hitting .327 (32-for-98) with 10 doubles, 11 home runs, 33 RBI and 25 runs scored in 26 games...His 33 RBI in June led all Major League players, as did his 21 extra-base hits while his 75 total bases led all National League players...Against right-handed pitching he hit .258 (118-for-457) with 24 doubles, four triples, 20 home runs and 72 RBI with a .791 OPS, while hitting .261 (37-for-142) with eight home runs and an .814 OPS vs. left-handers...With runners in scoring position he hit .280 (37-for-132) with seven home runs. Played in 60 games for the Padres, missing time with two separate stints on the disabled list....Made his second career and second straight Opening Day roster, starting in center field and hitting leadoff Opening Day, 4/6 at LAD...Over his first 32 games he hit .291/.340/.493 (39-134) with five home runs, 19 RBI and 28 runs scored before landing on the 15-day DL on 5/19 (retroactive to 5/11) with left wrist tendinitis… missed 28 games before returning from the DL on 6/11....Over 23 games in the opening month, he hit .286 (28-98) with four home runs, 15 RBI and 21 runs scored, the third-most runs scored in the month of April in franchise history and most since Al Martin scored a franchise-record 25 runs inApril 2000…his 21 runs scored in April were tied for the most in Major League Baseball with St. Louis' Matt Carpenter....At the time his first injury took him down, his 28 runs scored from 4/6-5/10 were most in the Majors while his 39 hits ranked tied for ninth in the Majors and tied for third in the National League....Over a four-game streak from 4/28-5/2 he scored multiple runs in four-straight games, matching the Padres franchise record…fourth time a Padre scored multiple runs in four-straight and first since Damian Jackson in 2001 (4/5-8/01)… only others to do so were Greg Vaughn in 1998 (7/13-17/98) and Bip Roberts in 1990 (9/16-19/90)....Played in three games 6/11-13 before landing back on the 15-day DL on 6/15 (retro to 6/14) with left wrist tendinitis...Underwent surgery on 6/18 to remove a bone spur in his left wrist, performed in Scottsdale, AZ by Dr. Donald Sheridan…transferred to 60-day DL on 8/8....Missed 70 games on the DL a second time before being reinstated from the DL on 9/4....Played in 25 games from 9/4 through the end of the season, hitting .208 (16-77) with three home runs and 10 RBI....Recorded a career-high tying four RBI on 9/14 atARI, sixth four-RBI game of his career and first since 5/4/14 at NYY....Made 56 starts total, with 33 in center field, 19 at first base, three in left field and one in right field…each of his first 28 starts came in center field while 19 of his final 28 starts came at first base...Of his 56 starts, 51 came batting leadoff…in those 51 starts batting leadoff he hit .271/.343/.459 with eight home runs, 29 RBI and 40 runs scored…hit two leadoff home runs, his lone two career leadoff homers, with his first on 4/25 vs. LAD and his second on 9/14 at ARI....Overall on the season hit .350 (14-40) with runners in scoring position, including .348 (8-23) with RISP and two outs. The reigning American League Rookie of the Year was limited to 87 games due to a right wrist fracture...Was sidelined 70 games from 5/5 - 8/20…started 84 games (76 in RF, eight at DH) and made appearances at first base (two games) and center field (one game)...Made his first Opening Day roster on 3/31 vs. TOR…started in right field and went 3-for-5 with a double and two RBI...Hit everywhere from first to seventh in the starting lineup during the course of the season…hit leadoff twice for the first time in his career on 5/13 at SEA and 5/21 vs. OAK...Logged his third career multi-homer game on 4/19 vs. NYY in what was his 104th career game…since 2000, he is one of four Major League players to total three multi-HR games in his first 104 career games before turning 24 years old, joining Laynce Nix, Brad Miller and Ryan Braun...From 4/28 - 5/15, hit .290/.339/.477 (31-for-107) with eight doubles, four home runs and 16 RBI in 26 games...On 5/4 at NYY, hit a three-run, inside-the-park home run off CC Sabathia…it was the first inside-the-parker in the Majors in 2014...Became the first visiting player with a grand slam and a inside-the-park HR at new Yankee Stadium…the slam came on 6/23/13, also off Sabathia...Began his career with a 13-game hitting streak at Yankee Stadium before going hitless on 9/9…per ELIAS, it was the longest streak in road games against the Yankees to begin a career since WSH Eddie Foster in 1912-13 (17 games) at Hilltop Park and the Polo Grounds...Had a two-RBI sac fly on 9/16 vs. NYY, the first two-run sac fly in Rays history scoring Evan Longoria from third base and James Loney from second base…it was the first two-run sac fly in the Majors since LAA Mike Trout on 8/10/12 vs. SEA. Hoot Evers in 1946 (33 RBI in 81 games). compared to 36-33 (.522) before it. hit .310 (22-for-71) with 10 2B, 2 HR and 11 RBI. when Desmond Jennings was on the DL. Rays to have multiple 2-HR games as a rookie. season since CWS Chris Singleton in 1999. Enrique Wilson on Sep 21, 1998. .351 (34-for-97) with 5 HR and 22 RBI. the majors and Durham in 152 games. Acquired from the Kansas City Royals on Dec 9, 2012, as part of a seven-player trade that sent pitchers James Shields, Wade Davis and a player to be named later (INF Elliot Johnson) to the Royals for Myers and three other prospects... In 2012, became the third player ever to win the Baseball America, USA Today and Topps Minor League Player of the Year awards in the same season, joining Andruw Jones (1996) and Josh Beckett (2001)... His 37 home runs between Double-A Northwest Arkansas and Triple-A Omaha were the 2nd most in minor league baseball, 1 shy of 26-year-old Darin Ruf, who hit 38 for Double-A Reading (Phillies)…his 313 total bases led all minor leaguers and his 109 RBI ranked 4th...his .987 OPS was 5th among full-season minor leaguers…he was one of six minor leaguers with a .600 or better slugging pct... According to Baseball America, became one of 10 minor leaguers in the past 50 years to hit 35 or more home runs above Class-A before turning 22…only two others matched or exceeded his 37 HR: Arlo Engel (41 for Double-A El Paso in 1963) and Paul Konerko (37 for Triple-A Albuquerque in 1997)…his 37 HR were 29 more than he hit in 2011 and 23 more than he had ever hit in any of his previous three minor league seasons... Made a total of 83 starts in CF, 18 in RF and 15 at 3B... Was the second-youngest regular in the Pacific Coast League, trailing only Seattle shortstop prospect Nick Franklin (who was transferred from Double-A Jackson to Triple-A Tacoma on June 20)... Collected 2 hits and drove in 3 runs for the U.S. squad at the Futures Game in Kansas City on July 8, his second straight Futures Game appearance…three days later was selected the "Star of Stars" for the Pacific Coast League in the Triple-A All-Star Game after recording 2 hits, including a double, with 1 RBI. Wil spent the entire season with Northwest Arkansas (AA)...missed significant time with a serious lacerationon his knee and a subsequent infection ...Followed up his campaign as one of the best hitters in the Arizona Fall League, batting .360 (31-for-86) with 5doubles, 5 triples, 4 home runs, 18 RBI and 24 runs scored in 23 games for Surprise...finished second in the leaguein on-base pct. (.481), third in slugging (.674) and third in OPS (1.156)...his 20 walks tied for the league lead. August 13, 2018 San Diego Padres activated LF Wil Myers from the 10-day injured list. August 12, 2018 San Diego Padres sent 1B Wil Myers on a rehab assignment to Lake Elsinore Storm. June 21, 2018 San Diego Padres activated LF Wil Myers. June 14, 2018 San Diego Padres sent OF Wil Myers on a rehab assignment to El Paso Chihuahuas. April 29, 2018 San Diego Padres placed RF Wil Myers on the 10-day disabled list. Left oblique strain. April 20, 2018 San Diego Padres activated OF Wil Myers from the 10-day disabled list. April 17, 2018 San Diego Padres sent OF Wil Myers on a rehab assignment to Lake Elsinore Storm. April 4, 2018 San Diego Padres placed OF Wil Myers on the 10-day disabled list retroactive to April 3, 2018. Right arm nerve irritation. September 4, 2015 San Diego Padres activated OF Wil Myers from the 60-day disabled list. September 1, 2015 San Diego Padres sent RF Wil Myers on a rehab assignment to Lake Elsinore Storm. 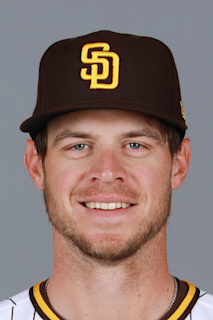 June 15, 2015 San Diego Padres placed CF Wil Myers on the 15-day disabled list retroactive to June 14, 2015. Left wrist tendinitis. June 11, 2015 San Diego Padres activated CF Wil Myers from the 15-day disabled list. June 7, 2015 San Diego Padres sent OF Wil Myers on a rehab assignment to El Paso Chihuahuas. May 19, 2015 San Diego Padres placed CF Wil Myers on the 15-day disabled list retroactive to May 11, 2015. Left wrist tendinitis. December 19, 2014 Tampa Bay Rays traded CF Wil Myers, C Ryan Hanigan, LHP Jose Castillo and RHP Gerardo Reyes to San Diego Padres for C Rene Rivera, RHP Burch Smith and 1B Jake Bauers. August 20, 2014 Tampa Bay Rays activated RF Wil Myers from the 60-day disabled list. August 9, 2014 Tampa Bay Rays sent RF Wil Myers on a rehab assignment to Durham Bulls. July 24, 2014 Tampa Bay Rays sent RF Wil Myers on a rehab assignment to Durham Bulls. June 18, 2013 Tampa Bay Rays selected the contract of RF Wil Myers from Durham Bulls. March 31, 2013 Wil Myers assigned to Durham Bulls from Montgomery Biscuits. February 4, 2013 Tampa Bay Rays invited non-roster OF Wil Myers to spring training. December 9, 2012 Tampa Bay Rays traded RHP James Shields, RHP Wade Davis and Player To Be Named Later to Kansas City Royals for LHP Mike Montgomery, RHP Jake Odorizzi, 3B Patrick Leonard and RF Wil Myers. December 9, 2012 Wil Myers assigned to Montgomery Biscuits. December 9, 2012 OF Wil Myers roster status changed by Omaha Storm Chasers. May 16, 2012 OF Wil Myers assigned to Omaha Storm Chasers from Northwest Arkansas Naturals. January 25, 2012 Kansas City Royals invited non-roster RF Wil Myers to spring training. July 11, 2011 Wil Myers roster status changed by Northwest Arkansas Naturals. July 9, 2011 Northwest Arkansas Naturals placed OF Wil Myers on the temporarily inactive list. June 5, 2011 Northwest Arkansas Naturals activated OF Wil Myers from the 7-day disabled list. May 15, 2011 Northwest Arkansas Naturals placed OF Wil Myers on the 7-day disabled list. March 30, 2011 OF Wil Myers assigned to Northwest Arkansas Naturals from Wilmington Blue Rocks. March 7, 2011 OF Wil Myers assigned to Kansas City Royals. July 1, 2010 Wil Myers assigned to Wilmington Blue Rocks from Burlington Bees. April 5, 2010 Wil Myers assigned to Burlington Bees from Idaho Falls Chukars. August 25, 2009 Wil Myers assigned to Idaho Falls Chukars from Burlington Royals. August 18, 2009 Wil Myers assigned to Burlington Royals. August 17, 2009 Kansas City Royals signed C Wil Myers.